The beauty of sport is that it doesn’t matter if you have the eye-hand coordination of a fish and the fitness level of a sloth, you can still get involved. And that’s because watching sport is one of life’s little pleasures, with the added bonus that as a spectator, you’re magically bestowed with all the sporting knowledge and skills you don’t have when you try to play. Who hasn’t yelled at the television during an exciting match: ‘For goodness’ sake, I could’ve kicked the goal from there!’? By ‘Major’ sporting event, I mean something SO BIG that it has the words ‘OLYMPIC’, ‘GRAND’ or ‘NAME-OF-A-COUNTRY OPEN’ in the title. 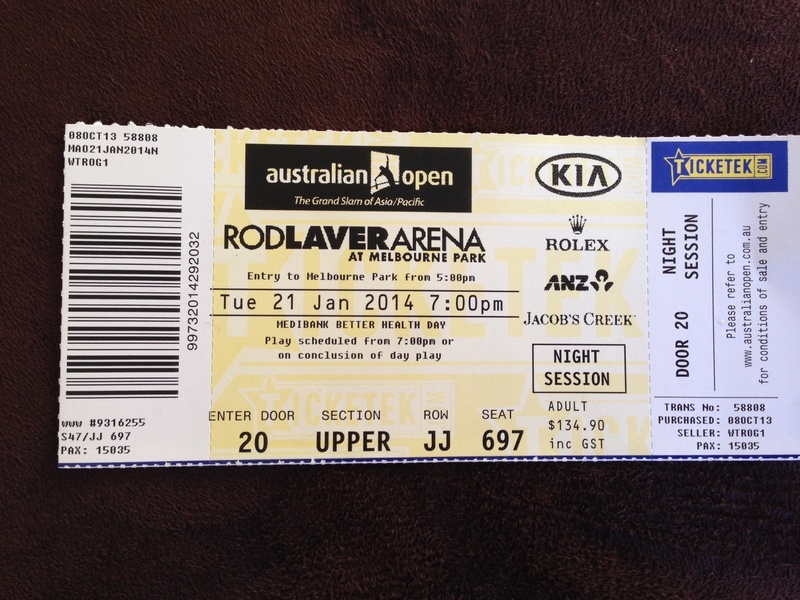 So when generous friends bought me a ticket to attend a Centre Court match during the Australian Tennis Open last January, how could I resist? “‘Name-of-a-Country’ Open”, “Grand”, “Slam” and “Asia/Pacific” in one hit. Bingo! The ticket was for an evening session early in the second week, which was perfect. The extreme weather that caused such debate during the first week was no longer a problem and being the second week, we were pretty much guaranteed players of high calibre. My match was between the highly fancied second seed, Novak Djokovic and the hitherto almost unknown Swiss player, Stanislaw Wawrinka. I was unkindly expecting a quick three-setter, judging that Novak would demolish his opponent in no time. Shows you how much I know about tennis. By the time the fifth set began, we were on the edge of our seats, the noise level in the stadium would have raised the roof, had it been closed, and while I still waited for the inevitability of a Djokovic win, it was marvellously exciting to watch. Except that the unthinkable happened, and Stan Wawrinka triumphed in one of those magical endings you never forget. He went on to win the title a few days later. So just how good is Attending a Major Sporting Event? You’re wrapped up in the atmosphere, part of a wave of supporters all focussed on the same action, at the same moment. You feel like your support is essential to the players, and that you, too, are as important as the players. And I also got to experience a screaming, roaring, very partisan Djokovic fan sitting right next to me. A fan who, interestingly, spent the entire match flicking through photos of scantily-clad women on his smart phone – which fortunately didn’t seem to worry his girlfriend – and only looked up to emit an ear-splitting bellow when he realised Novak must have won a point. But are there any downsides to Attending a Major Sporting Event? Only one or two, really. Having to queue between games for a bottle of water so pure, so pristine that you’re prepared to pay the equivalent of an airline upgrade for it can be a bit annoying. As is waiting … and waiting … at the bottom of the stairs, missing important play, until the organisers let you resume your centre court seat at the next break. And of course, the other problem with such an intense, live experience is the slight let-down when you realise that you’ll be watching the remaining matches on television and will no longer be able to influence the results like you (think) you can when you’re in the crowd. To counteract this, I invited friends around to watch the semi-final as a ‘special television event’ on my big screen a few nights later. It had its advantages. We could chat through the points without being ordered to be ‘quiet please’, we saw all the play in exquisite close-up detail and we had puzzling decisions explained by the commentators while we ate and drank whatever we wanted, whenever we wanted without breaking the bank. And enjoying a comfort break without having to wait for my friends to let me re-enter my television room was priceless. 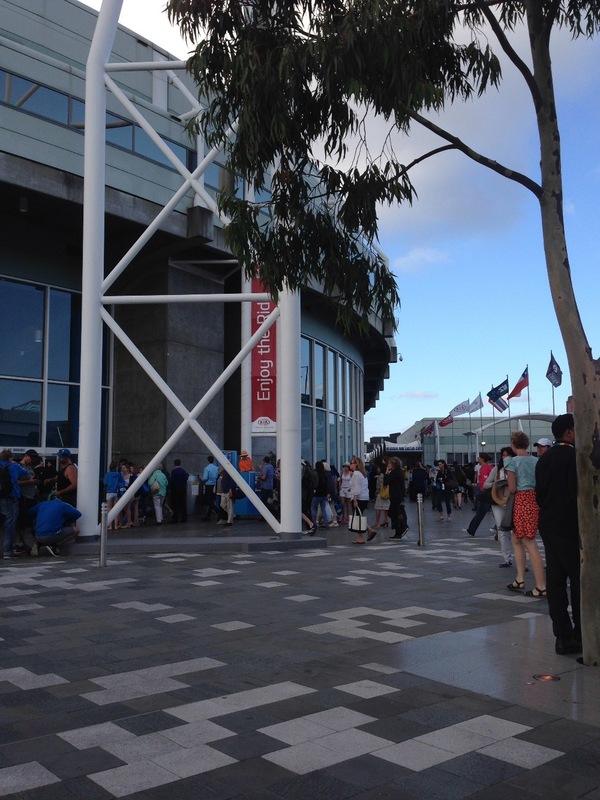 This entry was posted in Travel, Try Something Different and tagged Attend a Major Sporting Event, Australian Open 2014, Novak Djokovic, Stanislaw Wawrinka on April 30, 2014 by outsidethesquare101.